When researching natural salt supplies to include in our real food range, Cyndi wanted to use a salt that hasn't been in the ocean for the last several hundred years as most of our oceans are polluted to some degree. 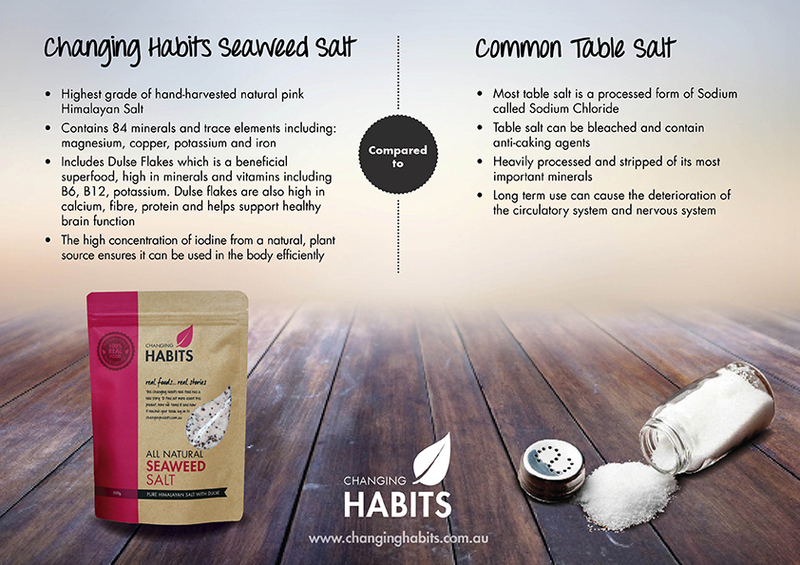 Our Seaweed Salt is a land-based salt with no refining, bleaching or anti-caking agents added. Wanting to naturally idodise the salt using a real food rather than a man-made product, Cyndi researched and added organic Dulse (seaweed) Flakes to the salt. Dulse is a beneficial super food, high in vitamins and minerals including Vitamins B6, B12, A, Iron, Potassium, Phosphorus, and Manganese. It helps heal poor digestive systems, rebuilds and maintains all glands in the body, and cleanses the body of heavy metals. Dulse is also high in calcium, fibre, and protein and helps support healthy brain function. When researching natural salt supplies, I wanted to use a salt that hasn't been in the ocean as most of our oceans are polluted to some degree. So I decided on using a land-based salt that has not been refined, bleached or had anti-caking agents added. As most salts can be low in Iodine, I have added the natural Iodine-rich dulse flakes to the Himalayan salt - adding the mixture of these two in your daily diet can assist in absorbing the 84 minerals and trace elements and is wonderful for our hydrating process. I also recommend adding 1/8 teaspoon salt in 500ml water on a daily basis, to assist in hydration.